After getting back in mid-July from vacationing in the Philippines, I dove right back into my storytelling agenda. My first assignment was to facilitate the board retreat of an international organization with a mission to engage civic-minded citizens to be positive agents of change in their local communities through leadership and service. The objectives for the retreat were to strengthen relationships between board members and to develop a cohesive message to other members of the organization for achieving specific goals. Each participant shared stories about personal experiences as a volunteer that were transformational. Their stories revealed common beliefs in how their mission can change the lives of people they serve after seeing how it has changed their own lives. I enjoyed listening to their stories as I got to know each of them on a more personal level — their aspirations, challenges and values. They tugged at my heart strings and, in some cases, I burst out laughing. Either way, I was moved to the very core. I couldn’t remember the last time I was in a room filled with so much empathy, compassion and camaraderie. Everyone agreed that building a story bank was an important first step to enhance storytelling within the organization. Here’s the link I shared to get them started. It’s one example of how Families USA collects stories and uses them. Let me know if this proves to be useful to you or if you already have a story bank. Would love to hear from you. For more information about the workshops, visit the workshop series page. I took an extended summer break and recently returned from a long vacation in the Philippines where my family and friends celebrated my aunt getting married for the first time. She’s 62. Annie was living in France in the 1970’s when she met Thomas. Their romance lasted for more than a year until Thomas popped the question. It would have been a sure thing except he wanted to have children, but she didn’t. They found no compromise to stay together so they parted ways. Thomas moved to Switzerland and started a family. 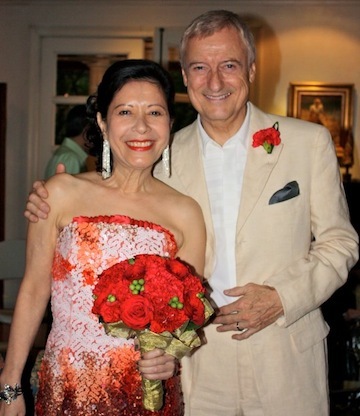 Annie stayed in Paris for another twenty years before returning to Manila to be with her aging parents. She decided to stay for good. In March 2011, Thomas booked a flight to the Philippines after his friend and colleague asked for his help in setting up a new business venture in Asia. At the time, Thomas was retired and had been divorced for ten years. A few days after arriving in Manila, Thomas started a search to be reunited with Annie. The phone book turned up several Annies, but not his. He tried his personal connections and found Nora who used to do business with my aunt. When Thomas called the number that Nora gave him, a familiar voice answered. Since then, Thomas never let go. Every day was a proposal; every moment a serenade. He canceled his departure for Switzerland and vowed to woo her until she said yes. After four more months, Annie finally made Thomas the happiest man on earth. If you know Filipinos, you probably already guessed that the turn of events was not without influence from Annie’s family. But that was only because they realized that Thomas and Annie were meant to be. Only by being together can their real story begin. Our lives reflect either the truth about us and our values, or the expectations of others. Are we exhibiting our own choices, or that which others impose on us? Real stories come from real relationships. It doesn’t have to be a marriage made in heaven; there only has to be honesty. What is your real story? Do your donors, volunteers, board members and staff share your organization’s values and vision? Are they also telling your real story? Will you enter into a relationship for the short-term gain? Or do you purposefully seek true partners whose contributions will sustain for the long haul? Annie and Thomas taught me that living happily ever after is not the point. Rather, it’s believing that together you will. Our new workshop series begins September 20 with our popular writing workshop Commercial-ize Your Mission. We’re hosting two workshops in October – Don’t Let Words Get in the Way on the 11th and The Power of Symbols on the 18th – both focusing on other tools of storytelling beyond the conventional use of words. Finally, save the date for our newest workshop – Writing for Video – on November 13. Details coming soon. Registration begins next week Tuesday, August 28 – stay tuned for more details. Meanwhile, enjoy the rest of summer.